The ESI instrument is a versatile, multi-mode spectrograph and imager. There are two distinct spectroscopic modes: a medium-resolution echellette mode with prism cross dispersion; and a high-throughput mode using prism dispersion only. The spectrograph modes cover the full wavelength range of the Keck II silvered mirrors (3900 to 11000 A) in a single exposure. The low-resolution, prism-only mode provides the same spectral range, multi-object capability, and very high throughput. ESI also provides an imaging mode with a field of view of 2 arcmin x 8 arcmin. An Epps refracting camera and a single 2K x 4K detector are used for all three modes. View some construction images or engineering drawings. 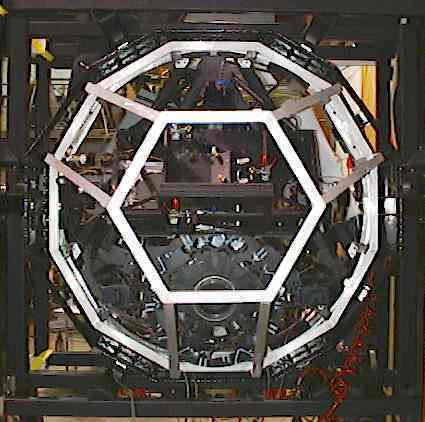 ESI saw first light at Keck Observatory August 29, 1999. The instrument is now being fully utilized. See the Keck ESI page for the latest details. Accumulated documents, images and test data for our pre-ship review. Accumulated documentation of the instrument mechanical and electronic stages. Schematics and descriptions for the ESI Instrument Electronics. Schematics and descriptions for the ESI CCD Controller Electronics. Collection of possible problems and cures.